In order to ease the management of the software released by LHCb, it was decided to put in place a database of the various applications and projects used by the experiment. This database gathers information about the projects, the versions released (and in which configuration). This information is already available from the release area or from the version control repositories, but it is not easily usable for all types of queries (e.g. which projects in depend on Gaudi vXrY...). It was therefore decided to duplicate this information in a database. At the same time, the Ariadne project started using the Neo4j graph database, which seemed to be a good way to store the graph of dependencies between projects. A prototype was therefore (quickly) prepared to validate this approach. In the Software configuration DB, there is a node for each couple (Project, Version). All the dependencies between couples (Project, Version) are specified as "REQUIRES" relationships. This dependency graph is the core of the database and allows navigating the dependencies in the various stacks. A number of other nodes/relationships have been created in order to ease the look up of nodes in the DB: * A node is created for each project (Brunel, DaVinci etc), which is linked to all the (project, version) for this project by a relationship of type "PROJECT". 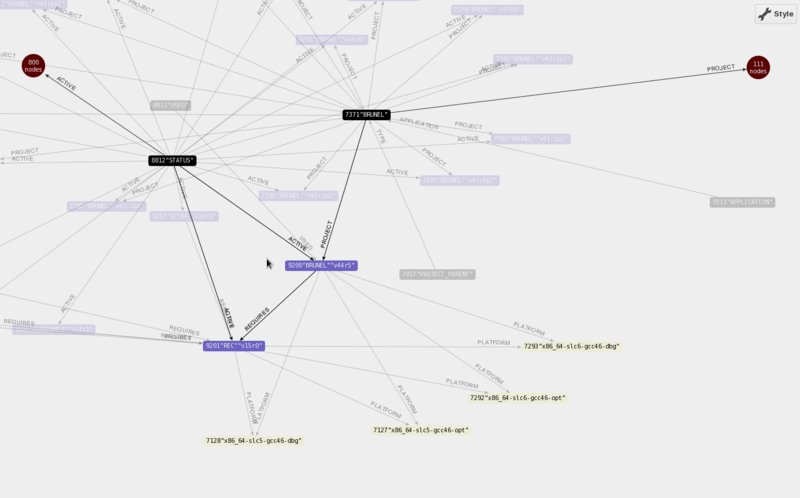 The project nodes themselves being related to a project_parent node. This allows to quickly list all projects, and all versions existing for a specific project. * platform nodes, one per platform, to which the (Project,version) are related ("PLATFORM" relationship) if the project was released for this platform. * An application node, to which all projects that are specifically marked as applications are related (relationship of type APPLICATION). * A "STATUS" node, to which all projects present on disk are related with a relationship of type "ACTIVE"
* A "USED" node, to which each used application can be related (relationship type: "USED") if they are effectively used. This is used to perform a check of the install area, where the projects that can be archived are the ones that are on disk and that are not used by an application that is used. The lb-sdb-importinstallarea -c and lb-sdb-setallappsused are needed to resynchonize the USED and ACTIVE flags in the DB before the check.